Princess Akasipi, has been lovingly looked after by the team at TherAmals, based in Bangor-on-Dee, who run a therapeutic animal service where clients can get to know a wide range of new animal friends and this week she enjoyed a visit to meet residents at the Chirk Court care home which is managed by Clwyd Alyn Housing Association in Chirk. 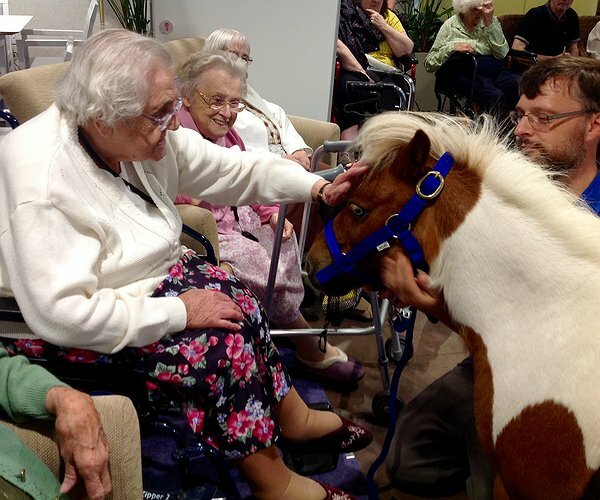 “Our pony visitor was originally a rescue pony and she was wonderfully calm and gentle. The residents were completely delighted to meet her,” said Mandi Southern, Activities Coordinator at Chirk Court. “We’re now all looking forward to a return visit from the TherAmals team in September when they are bringing along some therapy rabbits, chinchillas and other small animals,” added Mandy. "Veggie BBQ at Greenbank Villas"